Quilted, beaded, crocheted, felted, woven, dyed, ply-split, crazy-quilted, twisted and tied. Jean-Marie Tarascio, Pat Herkal, Barbara Ramsey, and Cathie Wier present their version of the forest. We are a group of fiber artists who meet together regularly to share ideas about art and art-making. Several months ago we put out the challenge - let's create a fiber forest. We each went off to our studios and from time to time gave each other a peek of our directions. With encouragement, we kept going and this window is our first display of the results. Please contact us if you have interest in hosting our forest or have questions regarding our work. The leaves I created to hang in the forest are pieced, embroidered and beaded using a variety of cotton fabrics. The leaves are realistic representations of leaves found in a book of leaf photographs. The critters living in the forest are also pieced, embroidered and beaded then stuffed with the addition of chopsticks, toothpicks and wire to add support where needed. They are made from a paper pattern I design, sampled using old flannel, stuffed, redesigned, pieced and stuffed again with fiberfill until I am happy with their shape and presence. The owl and raccoon are pieced from wool fabric cut from Goodwill jackets. 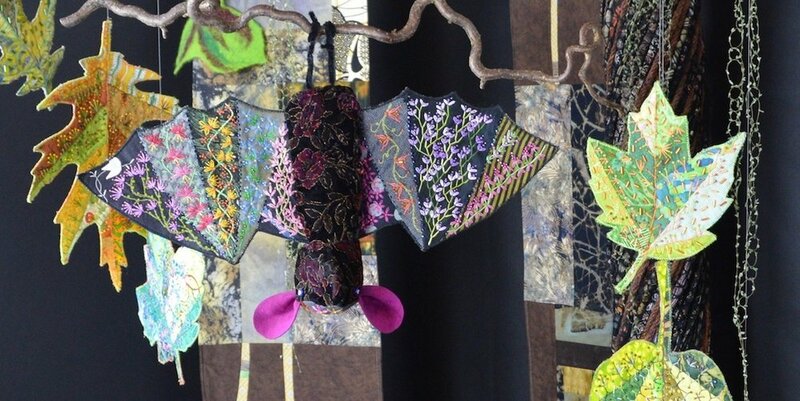 The bat and bunny have a variety of fabrics - ties, silk scraps, velveteen and handkerchiefs. The whimsical hanging forest flowers are made from kozo/banana and mango leaf papers. The papers have been felted to create a soft fabric like quality. Paper wrapped wire gives the flowers form and mobility, and hand dyed cotton threads create the flower's long knotted "tails". The recumbent logs are made from fabric scraps sewn into long cylinders which are then slid over recycled cardboard tubes (once used as a base for carpet rolls). 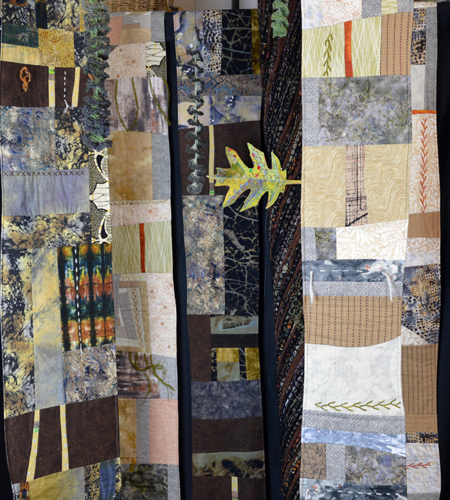 The flat vertical tree panels are pieced, layered with batting, and embellished with traditional quilting techniques. The forest "floor" is burlap, most of which has been colored with fiber-reactive procion dyes. The twisted trees are created by crocheting loosely around long strips of fabric. The strands are then wrapped around poles for support. The fiddle heads are made using a similar technique. The many yellow and green leaves on one of the trees are crocheted and then structured with wire. The mushrooms are formed using ply-split braiding. 4-ply cords are artist made and then ply-split, splitting one cord and pulling another through it. The ferns are made from loom-woven strips, then cut and manipulated. There are many woven pieces found throughout the forest, including the ribbed tree, woven in doubleweave to accentuate the ribs.